John Cassaday, Mark Waid, Kwanza Osajyefo, Yanick Paquette and Carla Speed McNeil spearhead the new line of comics. As promised, Humanoids revealed more about their H1 line of comics at New York Comic Con this week. Known mainly as a publisher of graphic novels for the last 20 years in America, Humanoids moves into the monthly comic market and shared universes with H1. With John Cassaday and Mark Waid already announced as being on board, the publisher revealed three additional “architects” of the H1 line: Kwanza Osajyefo (Black, DC’s Zuda imprint), Yanick Paquette (Wonder Woman Earth One, Swamp Thing) and Carla Speed McNeil (Finder, Sensation Comics). Working on the three ongoings will be Phil Briones, Vanessa Del Rey, Cheryl Lynn Eaton, Mike McKone and Afua Richardson. Plus: Tramp’s closing down, submissions open for a feminist critique of Whedon and more! Indianapolis Star cartoonist Gary Varvel was surprised, and none too pleased, when Donald Trump Tweeted one of his cartoons—with some unauthorized alterations. The original cartoon, which was published in January, was a play on the “Trump train” trope, showing a Trump-branded locomotive with a donkey plastered on the front. 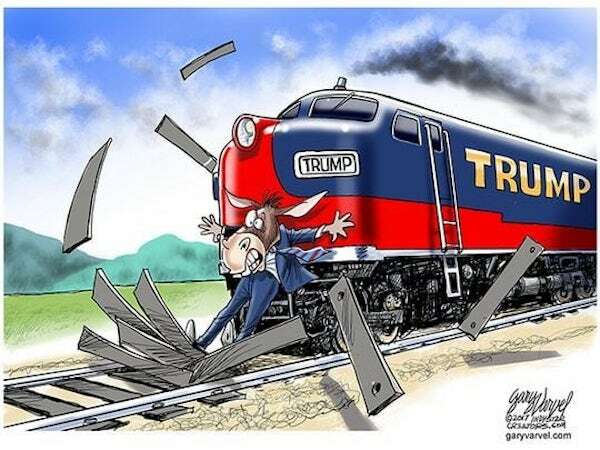 (Varvel was careful to note that the donkey is “resisting” the train but not being flattened by it: “No cartoon donkeys were killed in the making of this cartoon,” he said.) Trump retweeted another version that replaced the donkey with a CNN logo, added a line about “fake news,” and cropped out Varvel’s signature.